and André Goodfriend US Embassy Charge d'Affairs. 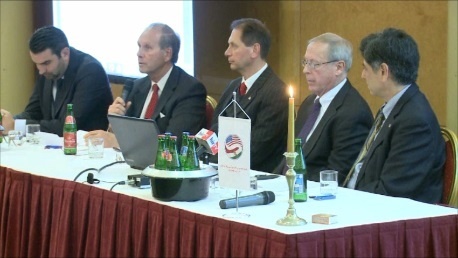 The Budapest FORUM to improve US-Hungary relations 11/26/2014. the Amerikaiak a Magyarokért Alapítvány (www.AMKL.org). The Forum was the first of a series to be held to restore the excellent relations that the United States had with Hungary for many years, but which had been deteriorating since the leftist government, which the U.S. government favored, was ousted in 2010. This first of a kind FORUM brought together parties that have differing views on the political landscape of Hungary and bilateral relations between the two natural allies. The purpose of the Forum was to candidly exchange ideas and come to an understanding of these various perspectives. The participants included the U.S. Charge d' Affaires André Goodfriend, Dr. Lomnici Zoltán, Jr., the spokesperson of the Civil Összefogás Forum ( CÖF), American Hungarian Federation President Frank Koszorus, Jr., Mr. Héjj Tibor President of Proactive Management Consulting, and Mr. (Jules) Gyula Balogh President of the Amerikaiak a Magyarokért Alapítvány. All of the participants had experience working or being educated in the United States. 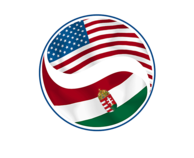 The FORUM followed a very moving Thanksgiving celebration where Americans, Hungarians and American Hungarians gave thanks for what they had received over the past year and shared the wonderful feelings they had for America. The FORUM started with observations by the participants of what was good about America and Hungary, as viewed by both sides. America was noted for its acceptance of foreigners and the rule of law by the Hungarians, and Hungary was noted for its friendliness to foreigners and its fights for freedom and democracy. Dr. Lomnici described his wonderful 6 years in the U.S. at the NIH where he had a grant to study issues relating to tobacco. Mr. Hejj described his obtaining his MBA in the U.S. where he went with his family and 4 children. He experienced the hospitality of the people and friendships with professors, the educational system, the honesty of the students, even the wonderful nursery for his children. He also talked about how friendly and accepting the students were to a youth who was disabled. Mr. Koszorus spoke about the freedoms and opportunities provided to all in the U.S. to succeed, and the tremendous benefits citizenship provides. Mr. Balogh spoke about coming to the U.S. at age 7 and how his mother said that you must always keep your Hungarian heart, but you are now an American. He mentioned the good things about the U.S. are the friendliness of the people and the willingness to help other people and the entrepreneurial spirit of the past. He also said that Hungary is a magical land, like Disneyworld, charming with wonderful people and a beautiful countryside. Mr. Goodfriend said that the U.S. and Hungary had many things in common. The U.S. has accepted people from diverse lands and that acceptance is one of the great strengths of America. Hungary in the past has also been very accepting of other peoples. Dr. Lomnici said he did not want to ruin the wonderful Thanksgiving atmosphere, so he politely described some of the problems in the U.S., such as discrimination against blacks and corruption, implying that the U.S. may not have much standing to criticize others. He also mentioned that the U.S. did not help Hungary in 1956 and that was a sore point among Hungarians. Mr. Balogh put forth the question of why the U.S. only criticizes conservative governments. Mr. Goodfriend had many good things to say about Hungary, such as that the people are friendly and that it is a democracy. He also indicated that he had an issue with the formulation of the latter question, since he felt that the U.S. approach was not criticism of one party but a dialogue about what the embassy observed in Hungary.